The poultry industry is the largest segment ofthe South African agricultural sector, contributing more than 16% to the gross domestic product. It provides employment, directly and indirectly, for nearly 108000 people throughout its value chain and related industries (DTI, 2017). Many people believe that poultry meat remains an affordable protein source as opposed to pork, beef and mutton. Some also view poultry meat as a healthy alternative protein for red meat. More than 935 million broilers were slaughtered in South Africa during 2016, which is 3,1% less than the number of broilers slaughtered in 2015. This begs the question of how the industry is performing if other affecting factors are taken into account. The gross value of South African agricultural products was estimated at just over R246 billion in 2016. The animal product sector contributed a lion’s share of 47% (R117 billion) to agricultural production. 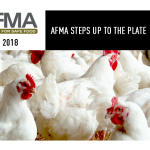 Slaughtered fowls in turn are the largest contributor to the animal product category, contributing more than R38 billion in 2016, while eggs added another R10,12 billion (DAFF, 2017). Production of white meat in South Africa has increased in recent years from 869 000 tons in 2001 to 1 704 000 tons in 2016. During this time, total consumption in South Africa has increased from 938 000 tons to 2 200 000 tons, with the per capita consumption showing healthy growth from 21,48kg in 2001 to 40,04kg in 2017. This per capita consumption growth is far more than what was recorded for red meat – a total of 18,96kg in 2001 vs 27,74kg in 2017 (DAFF, 2017). Egg production in 2001 was at 330 000 tons and increased to 478 000 tons in 2016. Local egg consumption was calculated at 308 000 tons in 2001 and increased to 441 000 tons in 2016, consistently remaining just below production numbers. At the same time, per capita egg consumption showed a slight increase from 6,92kg in 2001 to 7,89kg in 2017, with a peak in consumption experienced in 2007 (8,7kg/per capita). Poultry and poultry products showed a 48,5% increase in producer prices between 2010 and 2016. This number is lower than what was experienced by wool and mohair (143,3%); cattle, sheep and pigs (59,6%); and dairy products (51,2%). During the same period the price index of intermediate goods and services increased by 55,7% while the price of farm feed increased by 63,6% (DAFF, 2017), which sheds some light on the difficult position that the South African poultry industry finds itself in. This simply means that poultry profit margins are placed under pressure by rising production costs. 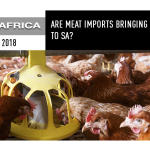 South Africa is still unable to produce sufficient quantities of broiler meat to satisfy demand, with the shortfall addressed through imports (DTI, 2017). Import statistics (Figure 1) show that South Africa imported 528 506 tons of chicken meat in 2016 compared to 457 374 tons in 2015. Numbers show that up until September 2017, South Africa had imported 392 109 tons of chicken. This is 10 584 tons less than the same period (January to September) in 2016. Imports broke through the 60 000-ton mark in March 2017 when an import value of 62 102 tons for the month was reported. 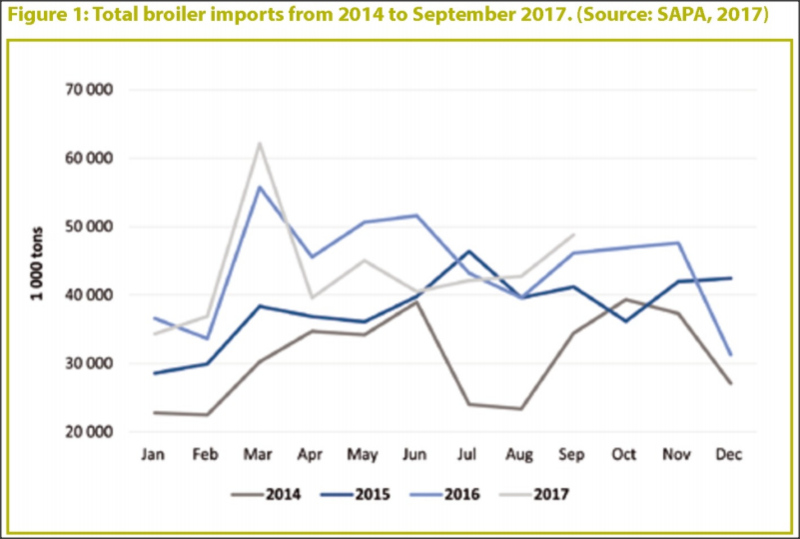 As stated in September 2017 data, the largest portion of broiler imports for the month consisted of bone-in portions of poultry (41,5%), mechanically deboned meat (40,9%) and frozen fowl offal (9,9%). 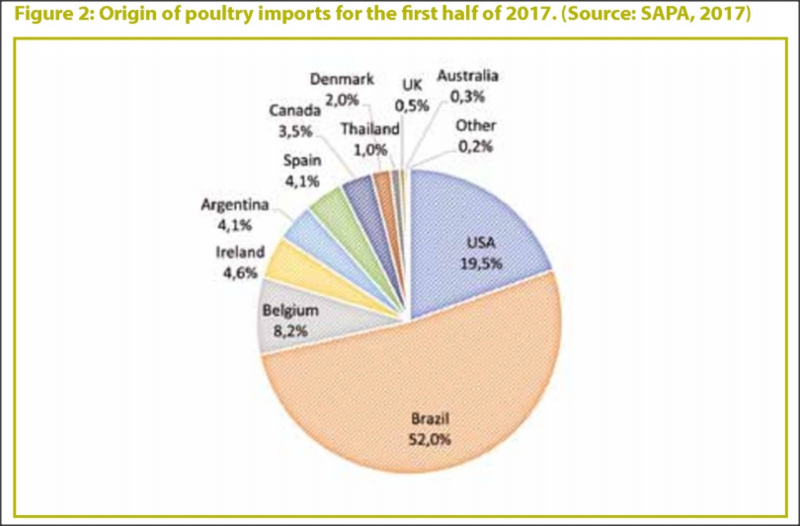 Brazil is by far the largest source of poultry imported by South Africa. 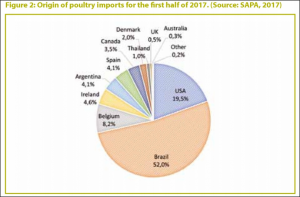 Values for the first half of 2017 show that 52% of the poultry originated in Brazil.The United States (US) was responsible for 19,5% of South African imports and Belgium for 8,2%. The European Union (EU) as a group (including Belgium) was responsible for the same amount of poultry imports as the US, coming to 19,5% (Figure2). During the first half of 2017, poultry import numbers for 2017 showed a 5% decrease compared to the same period in 2016. However, it was still 24% higher than the five-year average for January to June imports. 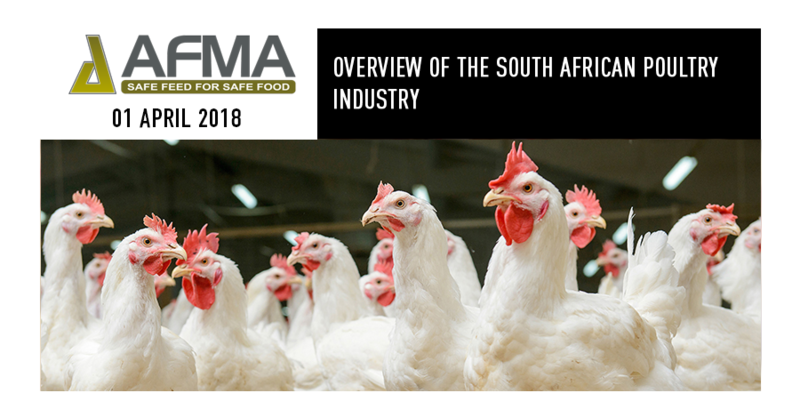 According to available sources, the South African poultry industry employs roughly 14 500 people at primary agriculture level, 27 600 at secondary level and in excess of 6 000 at distribution level. The sector contributes almost 60 000 jobs for indirect employees in supporting industries and another 18 137 jobs in the field crop sector (SAPA, 2015). The poultry industry faces several significant challenges that have hindered its competitiveness and growth potential. The principal challenges pertaining to the industry are rising feed costs, import penetration, rising electricity tariffs and access to reliable supply, exchange rate fluctuations and accessto finance and markets (DTI, 2017). Feed is one of the biggest production costs for broilers, which consists of approximately 60 to 70% maize and 25% soya bean meal. This causes production costs to fluctuate as grain prices increase or decrease in the market. As mentioned earlier, the price of farm feed has increased at a rate that exceeds the rate increase experienced in poultry products. Good news for some is the current low price of maize and the general outlook that grain prices will mostly move sideways in the short term, therefore feed prices seem more like an opportunity than a threat. The import of poultry meat has also been reported as a major source of risk for local poultry producers. By honouring different trade agreements that South Africa forms part of, it seems as if poultry farmers are drawing the shortest straw. Brazil is the biggest supplier of South Africa’s imported broiler meat claimed to be dumped in local markets. The AGOA (African Growth and Opportunity Act) is a United States trade act which aims to enhance market access to the US for qualifying sub-Saharan African countries, including South Africa, with the renewal of the AGOA agreement and the approval of the 65 000-metric ton free of anti-dumping duty import quota for the US. This adjustment seemingly sent the local broiler industry in a downward spiral. For the local poultry industry, which threw its weight against this quota, it was a red flag during the early stages of negotiation. The quota is set to grow, as local production and demand increases. Since the implementation of the agreement, Rainbow Chicken (RCL Foods) has reportedly cut 1 350 jobs and repositioned a further 200 staff members who were working in the chicken producing operation. The group is also planning to sell many of its broiler farms. It is claimed to be part of measures by RCL Foods to diversify their business model. The exact number of job losses in the industry is still vague, but is said to be in the range of 4 000 to 5 000 so far, with a further 110 000 at risk in the industry and roughly 20 000 jobs threatened in the feed industry. US poultry producers nearly reached their 65 000-ton export quota under the AGOA agreement for the year 2016/17. More than 50% of the quota came into the country in the last three months of the year, which was partially due to relationships that were built with South African importers. 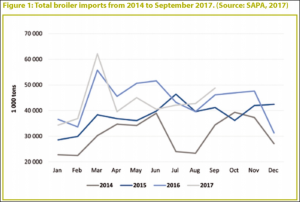 A slow start in the 2017/18 season was also reported for AGOA imported broiler meat (AGOA, 2017). The outbreak of bird flu (avian influenza) has led to millions of birds being culled to prevent the spread of the disease. Job losses have also been on the table due to the closing of poultry farms. The outbreak of bird flu cost the economy in excess of R900 million. The number of bird flu outbreaks up to November 2017 was 68, with less than half (21) of these incidences occurring in commercial chicken operations. Other outbreaks were reported from commercial ostrich, commercial duck, wild birds, hobby birds and backyard poultry farms. The Western Cape alone has culled two million ducks and chickens since the first outbreak. The Bureau for Food and Agricultural Policy (BFAP) has been given the green light for the first phase of their study into the economic impact analysis of the bird flu outbreak (SAPA, 2017). The US was the biggest producer of poultry in 2017 and accounted for 20,6% of the global production, followed by Brazil (14,7%), the EU (13%) and China (12,9%). The largest broiler meat consuming nations were the US (17,7%), China (13,2%), the EU (12,7%) and Brazil (10,5%). South Africa produced roughly 1,75% (2011) of the poultry in the world, while consuming roughly 1,92% (2016) (USDA, 2017). The country’s production is predicted to increase by 4,76% in 2018, which is the fifth highest predicted growth. This places South Africa in fifteenth position on the global production list, while the country’s consumption is placed in eleventh place (Index Mundi, 2017). Global production is forecasted to increase by 1% in 2018 to 91,3 million tons. This is mainly due to increases from the US, Brazil, India and the EU. Higher exports drive the increases in the US and Brazil, while steady growth in domestic markets is the driver in the EU and India. China’s production is expected to decrease by 5% in 2018 due to factors such as avian influenza, limited genetics, saturated markets and weak prices (USDA, 2017). Global export is predicted to increase to 11,4 million tons in 2018, 3% higher than in 2017. This expected increase is mainly due to Brazil recovering from a slow first six months in 2017 that was caused by quality issues. Brazil is expected to export 4% more broiler meat in 2018. This increase is driven by its product’s rebounding competitiveness as well as the effect of avian influenza on key competitors (USDA, 2017). Are meat imports bringing #listeria to SA?